Recent research deems that British toddlers are amonsgt the fussiest in Europe and with many parents admitting to only being able to cook around seven different meals for their children, it can come as no surprise that so many mums and dads regularly struggle to ge their children to eat. I would be surprised if you hadn't heard of Annabel Karmel, she herself is a mother of three children and she is the UK's number one parenting author, devising tasty meals for children. She has written a massive 26 books and has sold over 4 million worldwide. This busy lady is coming to rescue for many households as she has recently released the first book in her new "Quick & Easy" series, Quick & Easy Toddler recipes. Packed with over 100 full colour recipes that are not only great as part of a healthy balanced diet, they can be made in very little time, hopefully stopping those "mealtime meltdowns". There will be a recipe for any child in this book covering everything that includes breakfasts, lunches and dinners and those all important snacks inbetween. Really great for the whole family, not just the kids. Including things like burgers, muffins, pancakes and risottos, meal times will not be boring anymore. Breakfast time is the meal of the day that I struggle with because of having to have the children up, fed and dressed ready for the school run. 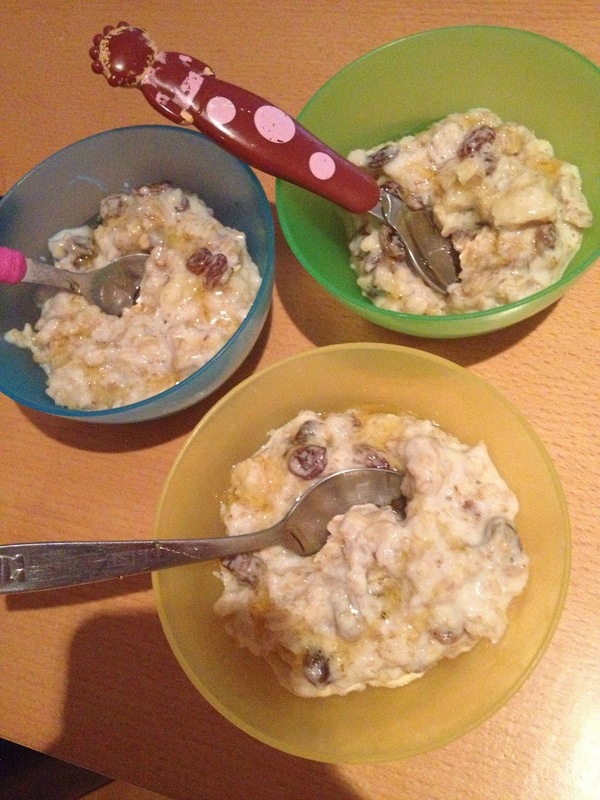 So it is no surprise really that my favourite recipe out of the book is for Fruit Porridge. Now my 3 year old has never been the biggest fan of porridge but I thought I would give it a go because it was nice to have to make one thing instead of lots of different meals. Very simple and speedy to make, it makes for a healthy yet filling breakfast, just what kids need to start their day + it will be perfect for those colder months that are fast approaching. I adapted the recipe slightly as I needed it to serve four people instead of three but this was again easily done and the end result was four happy customers and yes that did include Gracie. This recipe has converted her into a lover of porridge, I think the addition of banana might have swayed her slightly. I love this recipe book. With a RRP of £9.99, not only is it handy for parents, the bright colours inside make it nice for your children to look at too. And if like myself, you have older children, they can help when making the different meals as well. With the added addition of tricks to encourage children to eat and lots of time saving tips such as planning ahead, organise storage and the one meal rule, this is definitely a recipe book you want to have on your book shelf. Do you have fussy children when it comes to meal times, how do you deal with this?? This looks like just what we need, we've hit on a bit of a 'bored' patch, sandwiches and toast are thrown and I feel like I keep making the same dinners! Fussiness at the moment we just have to ignore and tell Joss she's made a good effort! Definitely one of the better recipe books out there!! This looks fab! I'm totally stuck in food rut at the moment so this could be just the inspiration we're looking for! This looks like a wonderful book for parents who have fussy eaters. Luckily our little guy eats well and is not at all fussy when it comes to eating healthy. That said we are expecting our second baby and hoping this one will be the same. If not I would consider this resource as it seems very helpful. Stopping by from the "Bloglovin Hop". Now following you on Bloglovin, G+, Facebook, and Twitter.